Servers | KGS | 'chenns' vs. 'kghin' - another exciting game! 'chenns' vs. 'kghin' - another exciting game! 'chenns' and 'kghin', both KGS 8-dan, have played a total of 16 games (so far). 'chenns' has the highest winning percentage (63%), having won 10 games (and losing 6). All their games are "ranked" - that is, their results affect the rating of the players - and it was 'kghin' who beat 'chenns' down to 8-dan (as you may know, chenns used to be 9-dan on KGS). I decided to show you a very entertaining game, recently played by them. Enjoy the fight! 'chenns' was kind enough to review the game afterwards, but he did it in Chinese... I removed the kibitz and added the variations in the game file (if the reader understands Chinese, he/she can find the original file at: http://files.gokgs.com/games/2011/3/14/chenns.sgf). 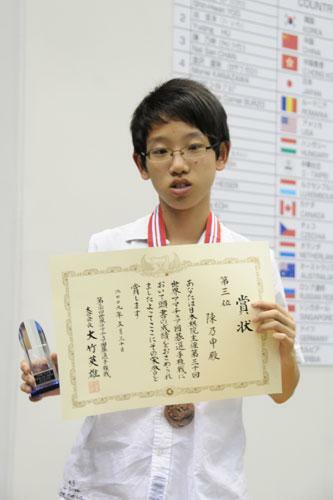 Black 17 (C11) has become a popular plan even in Europe (I believe that it was invented in China some ten years ago). If White answers Black 17 with a shimari (say White plays C14), Black will jump out at E6. However, after White 26 (E15), as 'chenns' pointed out, Black 27 (E14) was a mistake1. The sequence played in the game to White 34 made both sides very strong, but clearly the result was better for White because his thickness could now be of use, while Black's thick position was facing two strong White groups. Making it short, the thickness Black got was useless, while White's influence over the entire board was excellent. 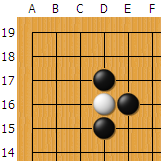 Going back to Black 27, and for this reason, 'kghin' should have played the shape move at D13 instead of E14. After the game, 'chenns' considered G18 for White to cope with the position at the top (again, you may want to check the variations in the game file). Black 103 (R12) was severely criticized by 'chenns'. He proposed Black Q12 instead. The main reason for this is the bad aji that Black leaves in this part of the board, which makes it possible for White to invade at Q17 later and live (it is not easy for Black to deal with that invasion because of the Q12 aji). Please note White 112 (L4). I am not sure what to say about it, but it is very original (to say the least). It was probably because of this move that during the game review 'chenns' suggested the connection of Black N3 (instead of M4). We can see that after White 126 (H6), Black's group at the bottom is in big trouble. Actually, during the game 'kghin' thought his group was dead, so he played elsewhere. However, there was a way for Black to rescue his group (you may wish to try to find it yourself before looking at the solution). It seems that it would have been better for White to first play the atari at N11 before turning to K14 (move 136) but, anyway, after Black's bottom group is captured, White already has a won game. 1 Beginners may find the following proverb useful: "Do not make moves that strengthen your opponent! ".